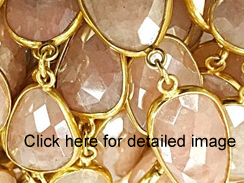 Faceted Mystic Pink Quartz RoseCut chain bezel-led in Vermeil - Gold Plated Sterling Silver. The stone is approximate 14mm - 21mm. New item from Jaipur for the most selective designer. Superb quality. Limited supply. Blush connector chain will work with all the neutrals.